So at the beginning of the year I signed up for two TBR challenges, the Official 2015 TBR Pile Challenge, hosted by Roof Beam Reader, and the TBR Double Dog Dare, hosted by James Reads Books. For the second, I challenged myself to read 100 books in my TBR pile in the first three months of the year, for the first, just one a month (which is what the challenge requires). Well, the first three months of the year disappeared under foot after foot of snow...we have only just now reached forsythia blooming time here in Rhode Island. And I did not read 100 books from my tbr pile. Out of the 96 books I have read so far this year, only 44 were true tbr pile books. 22 were review copies, and I failed at library limits, with 28 library books checked out and read, and two bought. Oh well. I shall keep trying to read the TBR pile for the rest of the year....I would like to get the number of books on it small enough, and organized enough, to count. But in any event, I am rather pleased with myself for having read a book off my TBR pile that is a perfect Earth Day book, and for remembering to write about it today! 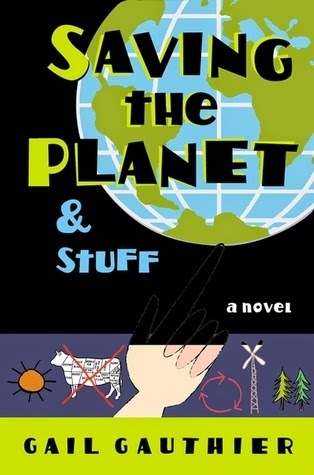 Saving the Planet & Stuff, by Gail Gauthier. It is the story of a not-high-achieving teenaged boy, Michael, who finds himself accepting an internship at The Earth's Wife, an environmental magazine. Michael finds it hard to cope with the green lifestyle of the old couple who run the magazine, and he finds it hard to understand the point of what they are doing. Gradually, he becomes, though not a true die-hard environmentalist, at least more aware of environmentalism, and (pleasingly for those of us who enjoy career type stories) he learns a lot about what goes in to publishing out a magazine. It's a good story, with lots of humor, and neither the book nor its characters are annoyingly didactic (although of course for me it was preaching to the choir). It's a good one to offer a somewhat directionless teen who might need a bit of educating viz what being Green means, or what having an internship means, or what getting along with two old people who seem very alien means.